Monrovia – Colonel Patrick Sudue, Inspector General of the Liberia National Police (LNP), has disclosed that officers of the LNP will stand guard to churches across Liberia on the night of Monday, December 31st, when Christians gather to worship on the night before the new year. Christians refer to this night as “watch night.” This Christian tradition has come a very long way, dating over a hundred years to the founding of Liberia in the early 1800s. Christians usually gather on New Year’s eve at their various churches to offer prayers and supplication to God for allowing them to enter the new year. 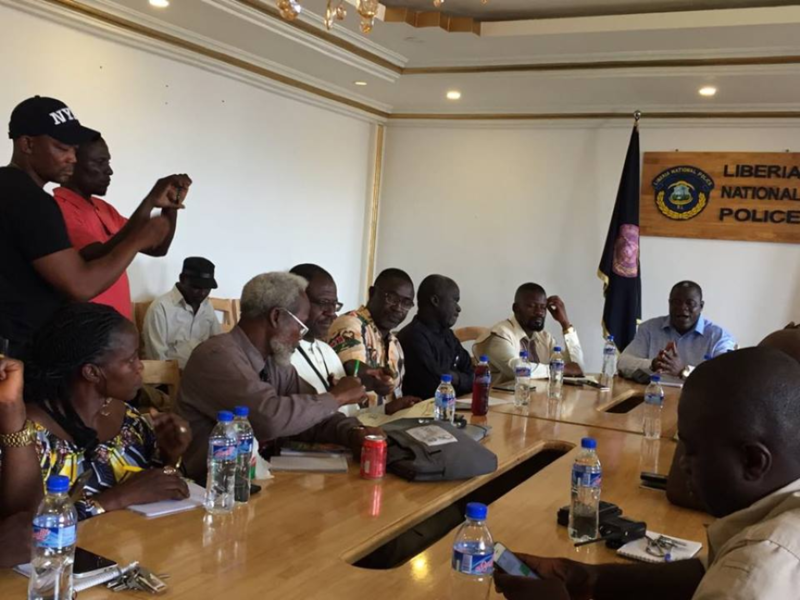 Col. Sudue, in a meeting with members of the Liberia Council of Churches (LCC) over the weekend, said the operation was geared toward providing security for churchgoers and to ensure that they return home safely. According to him, the LNP had done same for Muslims at the climax of Ramadan. This is going to be the first time in recorded history that officers of the LNP will provide direct security for Christians when they gather at their various places of worship. As to how the officers are going to achieve such Herculean task of protecting “all churches,” remains to be seen as inarguably there are more churches in Monrovia alone than the total number of police officers nationwide. However, Inspector General Sudue noted that officers will cover “major churches” across the 15 counties which will ensure that they are protected by physical security. “The LNP is religiously tolerant. We can give leverage to all in spite of religious creed; we are service-oriented,” Col. Sudue stated. LCC president Bishop Kortu Brown has extended praise to the LNP for the operation on watch night; according to him it is important because it helps in maintaining the peace. He told this newspaper that it is impossible for the LNP to have officer assign at every or all churches across the country. However, he stated that the LNP’s strategy along with the LCC would be to station, in addition to roving officers on moving vehicles, officers at churches that will have high concentrations of worshippers on watch night. Bishop Brown congratulated the LNP for engaging in community policing something he said will improve citizens’ trust in their police. The LCC has submitted to the LNP a list of over 40 churches in the Monrovia areas. It describes the churches on its list as “Prime Churches for Watch Night Security.” However, names of some notable churches, especially in the Sinkor areas did not make the list. The police has, meanwhile divided Monrovia and surroundings into six zones for this operation guarding angel III. 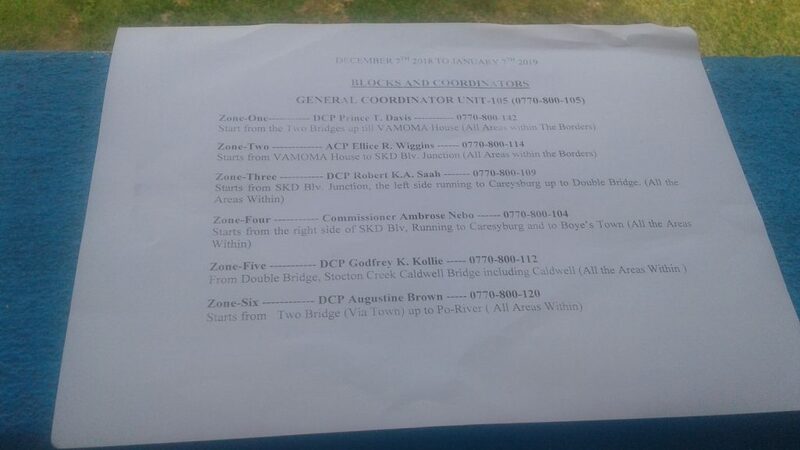 Each zone has the name of the senior police officer in charge along with their emergency contacts. Zone one begins from the King Zulu Doma and the Gabriel Tucker Bridges to Vamoma House. Zone two starts from Vamoma House to SKD Boulevard Junction. While zone three begins from SKD Boulevard the left side running to Careysburg up to the double bridges near Stephen Tolbert Estate. For Zone four, it begins from the right side of SKD Boulevard running to Careysburg and to Boy’s Town. Zone five starts from the Double Bridge to the Stockton Creek Caldwell bridge and Caldwell Township; while zone six starts from the two bridges linking Monrovia to Bushrod Island up to the Po River. As for the other 14 counties, police officers are expected to hold meetings with church leaders in those political sub-divisions in order to devise workable plans for provision of security for the watch night.